(InStyle.com) -- Blame it on all the family gatherings, the mistletoe, or even the champagne, but it's no secret that the holiday season is prime time for popping the question. A ring with a solitaire 1 carat diamond can cost up to 90 percent more than one with 1 carat in multiple stones. If you're one of the thousands planning (or hoping for) a proposal in the near future, don't head to the jeweler shopping without reading these top 10 engagement ring buying tips. There's more than one way to wear a carat of diamonds on your finger. A ring with a classic solitaire at this weight will generally cost thousands. But a band covered with tiny pavé diamonds that add up to just under 1 carat sparkles plenty and can cost up to 90 percent less than a ring with a big center stone. The way a diamond is framed can have a major impact on how big it looks. For example, a bezel -- a thin band of metal that wraps around a gem -- gives the illusion of a larger stone. A diamond of a carat or more should come with a gem report -- a gemologist's evaluation of the stone's color by letter grade (good stones are ranked no lower than I) and clarity, ranging from "flawless" (FL) to "very slight inclusions" (either VS1 or VS2) for an acceptable diamond. The cut, carat weight and measurements are also listed. The Gemological Institute of America issues most gem reports, but a few fine jewelry firms offer their own guaranteed certificates. The Tiffany & Co. Diamond Certificate lists a diamond's distinguishing characteristics and its linear measurements, accurate to within .02 millimeters. Platinum and gold are the top choices for engagement rings. The former will cost you -- a simple platinum band can cost nearly $600 more than a comparable one in gold -- but many brides feel the price is worth it. Platinum is a far more durable metal. 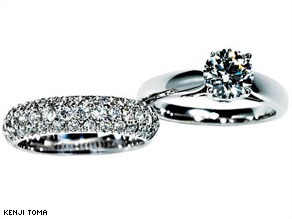 It will show fewer nicks and scratches, and platinum prongs will hold a stone more securely. As for color, some people believe that yellow gold casts an unflattering light on the diamond, while others prefer the hue's warmth and traditional look. The cost of protecting yourself against loss or theft depends on several factors -- including the value of your ring, of course, as well as where you live (major city dwellers will pay more). According to Donna Syverson, a spokeswoman for the national insurance firm Jewelers Mutual, your annual premium will be about 1 to 2.7 percent of the jewelry's appraised value, even for rings that cost six figures. Your diamond's certificate number (or jeweler's designation) can be laser-inscribed on the side of the stone, allowing it to be positively identified in case of theft or after cleaning or repair. Such inscriptions, which are visible under magnification (shown at right for the ring below) don't affect the gem's value. They cost from $40 to $200 and offer more than mere peace of mind: Some insurance carriers will give policy discounts on inscribed diamonds. Most couples look for diamonds in whole carat weights, but what you may not realize is that jewelers charge a premium for such stones. If you opt instead for a gem just under a carat (or under 2 or 3 carats, for that matter), the savings can add up to 30 percent. And the difference in size is so insignificant, you won't be able to tell. For a big anniversary, couples often replace their engagement ring with a grander model. When shopping now, ask jewelers if they'll accept this purchase as partial payment on a later ring. Both Tiffany & Co. and Jeff Cooper will apply the full retail purchase price toward another ring (that's at least double the value) for as long as you own your original one. Believe it or not, many reputable jewelers offer one-of-a-kind rings without charging exorbitant fees. Some companies require a minimum purchase or bill clients a small amount for preliminary work, such as drawings. The center stone constitutes the most expensive part of a classic solitaire ring, accounting for as much as 85 percent of its price. One way to cut down on the cost is to buy a diamond online. At a resource like bluenile.com or diamonds.com, it's possible to save up to 40 percent over prices at brick-and-mortar jewelry stores. Feeling nervous? Both e-tailers offer certified gem reports, as well as a full refund within 30 days on undamaged stones.